Below is a transcript of a letter by George Pemba to an unidentified recipient, written on February 3, 1936 and sent from King William's Town. "Once more I am communicating to you information regarding my progress in my art. "I am sending in accompaniment five of my latest pictures. Two of these pictures show American Negroes, Leslie Hutchinson and Martha Thomas, the former a singer and the latter an actress. These have been copied and enlarged from newspapers. The other two are altogether original and from imagination - the Abyssinian and "The Birth." The last is taken from the actual object. "After perhaps a circulation of these according to your wish, I would like them sent to any exhibition that you may think of. I also wish to apologise for my troubling you. If possible, I would like Mr. and Mrs. Yergan to see those pictures. "I am earnestly desirous of furthering my knowledge of this hobby. So far the fees that have been charged by the institutions I have consulted have been rather beyond my means as I have to be of great help to our big family and other concerns. "Draw from life and imagination. Keep away from strong drink. " 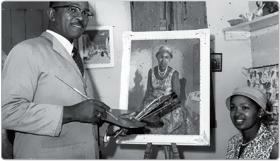 See Pemba painting at an easel in his garden, and what the memorial in front of his house looks like.